Today is the anniversary of one of the most important dates in the history of fiction. James Joyce’s novel Ulysses, one of the 20th century’s most important and most controversial novels, takes place on one day: June 16, 1904. The novel tracks the day in the life of three characters, Leopold Bloom, his wife Molly Bloom, and Stephen Dedalus, as they walk the streets of Dublin, Ireland. Although the book is set in Dublin, the characters and events parallel Homer’s Greek epic the Odyssey. But Ulysses is not written in verse nor a traditional prose style; instead, Joyce’s novel employs stream of consciousness narration, where instead of moving in a linear fashion, the story flows from the impressions, random thoughts, sensations, and associations of the characters. In an attempt to imitate the natural flow of the characters’ thoughts and dialogue, Joyce omitted conventional punctuation. This, along with the novel’s many allusions to history and literature, make the novel notoriously hard to read. 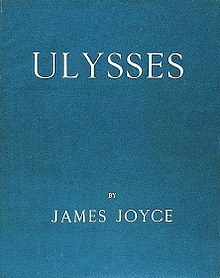 Even before Ulysses was published, it stirred up controversy because of its sexual passages. The novel was banned in the United States until 1933 when a New York judge ruled that the book was not obscene. Born in Dublin in 1882, Joyce attended Catholic schools in Ireland and earned a degree in Latin. This probably explains his selection of the name of Ulysses for his protagonist, since Ulysses is the Roman name for the main character in Homer’s epic poem, while Odysseus is the Greek name (1). June 16 is a date where fans of Joyce hold public readings of Ulysses, and in Dublin, fans retrace the steps of the book’s characters. One resource traces 365 days of “events that did not really happen.” It’s called The Book of Fictional Days by Bob Gordon. Gordon’s book ties each day of the year to events from fiction and film. What are the most memorable events from fiction? If you could memorialize one specific event from fiction on one specific day, what would it be? Select one unforgettable fictional moment in a book you love. You may not know the exact day, but describe the specific event, what happened, and why you think it is so memorable. For example, in Harper Lee’s novel To Kill a Mockingbird the climactic events of the novel’s final chapter — Chapter 31 — occur on Halloween night. Bob Ewell attacks Scout and Jem. Boo saves the children and stabs Ewell. After seeing Boo in the flesh for the first time, Scout escorts him home. The following are some additional fictional dates and events from The Book of Fictional Days (2). January 12: HAL 9000 becomes operational in 2001: A Space Odyssey. February 1: Willy Wonka gives a tour of his chocolate factory. February 14: Sam Baldwin and Annie Reed meet at the Empire State Building in Sleepless in Seattle. February 26: James Leer shoots Poe (Professor Grady Tripp’s lover’s husband’s dog) in Wonder Boys. May 1: Bilbo Baggins and Gandalf return to Rivendell and the house of Elrond in The Hobbit. May 15: Horton the elephant hears a small noise in Horton Hears a Who. June 3: Billy Joe McAllister jumps off the Tallahatchie Bridge. June 19: Mark Twain’s Connecticut Yankee arrives in Camelot (1528). 1 – Raftery, Miriam. 100 Books That Shaped World History. San Mateo, CA: Bluewood Books, 2002. On this day in 1846, the United States and Britain signed the Treaty of Oregon, which established the 49th parallel as the international boundary separating British North America and the United States’ Pacific Northwest. 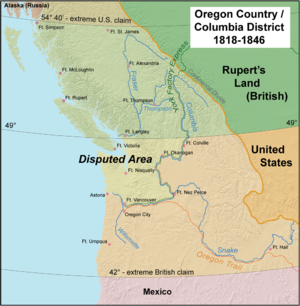 Beginning in 1818, the Oregon Territory — the region which today covers British Columbia and the states of Washington, Oregon, and Idaho — was jointly occupied by the United States and Britain. In 1844, little known Democratic candidate for president James J. Polk ran a campaign based on the expansion of the United States and the fulfillment of the nation’s manifest destiny. Polk’s slogan was “Fifty-Four Forty or Fight!” based on his campaign promise of expanding U.S. territory to the northern boundary of the Oregon Territory at latitude 54 degrees, 40 minutes. Once Polk won the presidency, however, he became less bellicose. Facing the prospect of a war with Mexico in the south, Polk sought to avoid a potential war with Great Britain by agreeing to a compromise that extended the 49th parallel border from the Rocky Mountains to the Pacific Ocean. On a day where we remember how the 49th parallel helped establish harmony between two nations, we should also remember how the concept of parallelism can bring harmony to writing. Let every nation know, whether it wishes us well or ill, that we shall pay any price, bear any burden, meet any hardship, support any friend, oppose any foe, in order to assure the survival of the success of liberty. Notice how each three-word phrase follows the same pattern of VERB – ADJECTIVE – NOUN. Notice also how the repeated structure creates balance and rhythm and clarity. Writing a sentence is like packing a suitcase. There is an art to getting everything in the bag — not just getting it in, but keeping it all organized and accessible. Parallelism is the secret weapon for writers who pack sentences, not suitcases. It helps them to pack a lot of ideas into a sentence in an orderly, logical way. Parallel structure, fully understood and put to use, can bring about such a startling change in composition that student writers sometimes refer to it as “instant style.” It can add new interest, new tone, new and unexpected grace to even the most pedestrian piece of writing. Mourning his dead father, berating his clueless mother, and continually contemplating the murder of his remorseless, treacherous, and lecherous uncle, Hamlet is not having a good day! Something, indeed, is rotten in the state of Denmark, and it’s not just the fish from last week’s dinner that has been festering in the corner of the Castle Elsinore’s kitchen. 2- Payne, Lucile Vaughan. The Lively Art of Writing. Boston: Allyn and Bacon, Inc., 1970.